Arrow #14 is a step back in several respects. It's a step back in time, as this flashback issue focuses upon The Lance Family over ten years ago. It's also a step back in terms of characterization for Laurel Lance and her younger sister Sara. The main thrust of the plot is simple enough. Sara is being bullied by a girl who thinks Sara is trying to steal her boyfriend. Quentin asks Laurel, who is busy trying to figure out her college plans, to keep an eye on her. Laurel blows off her father's request after Sara tells her she doesn't want help. Quentin starts teaching both girls how to fight. In fighting, Laurel learns something about life and herself that helps her find her path. The script by Mary Iacono fails to take advantage of the comic format. 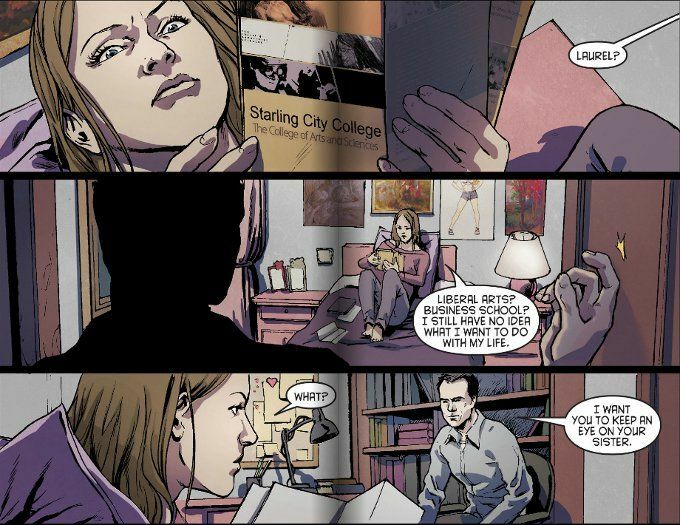 At one point, Laurel talks to herself to convey that she is having trouble deciding what she wants to do with her life. This information could have been revealed more naturally in the artwork, showing her looking at multiple college brochures in close-up. Heck, even a thought balloon would have seemed more natural. 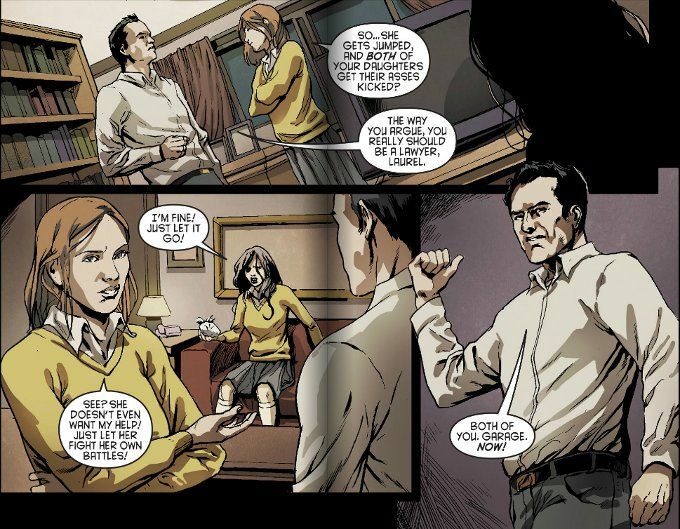 The story itself presents a larger problem in that it minimizes Laurel as a character by making the impetus of her desire to help people come about purely from her father forcing her to get involved. This is not to say that Quentin should have no role in inspiring Laurel or that it's wholly unbelievable that a teenage girl approaching college might be selfish regarding her problems taking priority over those of a younger sibling. No, the problem is there is no sign of the personal drive that lay at the heart of the Black Canary we all know and love or the Laurel Lance we've seen on the show. For that matter, there's no sign of the Lance girls' mother in all of this! It is Sara Lance who suffers the worst, though. Her entire purpose in this piece is to be a victim to be rescued. The conclusion of the comic even defines her as such! Worse yet, all we glean of her personality in this story is a confirmation of the one thing we knew about her from the show, i.e. she's the kind of woman who thinks nothing of trying to steal someone's boyfriend. The artwork by Xermanico is half-hearted, at best. The line work is competent enough in the close-ups but suffers in the middle-ground and background as details are lost. This problem is aggravated in several panels which are over-inked, further obscuring the pencils rather than emphasizing them. On the bright side, Xermanico does a decent job of caricaturing and de-aging the cast, though the over-inking does leave Quentin Lance with sagging jowls at one point. Bottom Line: This issue of Arrow is easily skipable unless you're a die-hard Black Canary enthusiast.